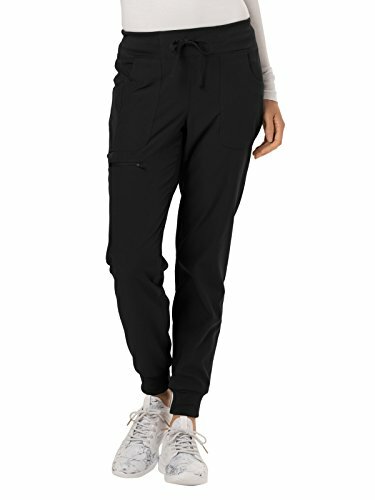 The Break On Through by heartsoul Women's The Jogger Low Rise Tapered Leg Scrub Pant get a dose of athleticism and comfort. You won't lose the utility you need thanks to a discreet zipper pocket and special pen slot. Junior contemporary fit Low rise Tapered jogger leg All around elastic knit waistband with adjustable drawstring tie closure Two front patch pockets with pen slot Two back patch pockets Front thigh zip coin pocket Signature triple heart and dotted heart heat transfers Cinched rib knit hemline 95% polyester 5% spandex fine dobby Total inseam: 29" regular 26½" petite and 32" tall This product can be shipped anywhere in the 50 United States Puerto Rico The US Virgin Islands and APO and FPO addresses. Sorry we cannot ship this product to any other address.